WiFi emits RF radiofrequency microwave radiation, and both wireless routers and wireless computers contain transmitters that send information back and forth through the air. Microwave radiation is able to penetrate walls made of wood, metal, and concrete. It can also penetrate our bodies. For someone first approaching this subject, it is important to know that there are 1000′s of peer-reviewed, published studies, many by the military, that have found biological effects from RF radiation. The public is unaware of the depth of this research that has been going on for at least 80 years. We are told that the jury is out, that there is no conclusive evidence that RF causes harm, but that more research is needed.The science tells a different story. For example, all long-term (over 10 years), case-control studies on cell phones have found an increased risk of cancer. Scandinavian studies show that children are most at risk, with over 500% increased risk. It is generally assumed that WiFi emits less radiation than cell phones. Actually WiFi emits levels of radiation that are higher than levels shown in scientific studies to cause adverse health effects. WiFi can emit the same amount of radiation as cell phones. iPads in particular emit very high levels. Consider the duration, or length of time that these devices are being used compared to cell phones ten years ago. Children are much more vulnerable to RF microwave radiation due to their thinner skulls, undeveloped immune sytems, rapidly dividing cells, and higher water content.How many studies does it take to show that RF microwave radiation is unsafe for children?If WiFi is said to be safe, but that hypothesis is disproven by just one study showing adverse effects. That’s how science works. But again, there are actually 1000′s of studies showing effects, some reporting correlations, and many reporting causal evidence. The truth can be inconvient, but it’s still the truth.None of this will create a change in policy though. Schools won’t look at the research, won’t give it consideration, and certainly won’t make any changes without sufficient public pressure. It takes parents educating themselves and getting together. 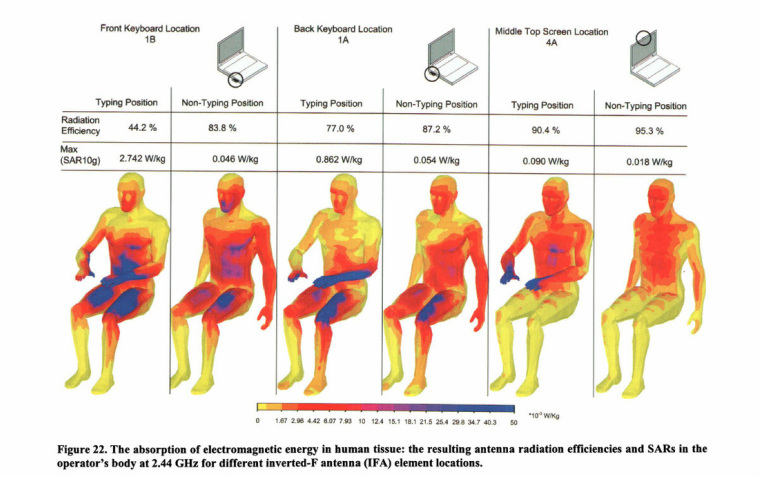 WiFi emits RF radiofrequency microwave radiation that allows information to be transmittted back and forth between the computers and the router or modem through the air. The specific frequency that WiFi uses is 2.4 GHz, or 2.4 billion cycles per second. This is the exact same frequency as a microwave oven. Of all the frequencies to use, this is one of the most harmful. Only minute levels of microwave radiation exist naturally, because the atmosphere blocks it from reaching the earth. 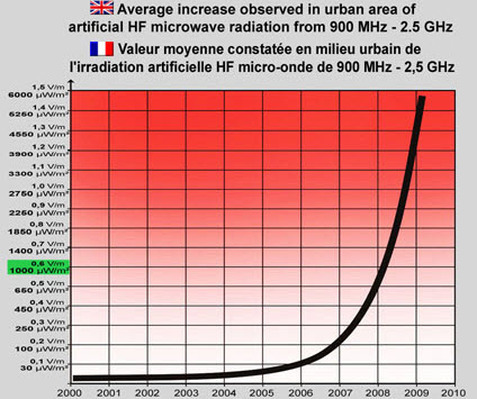 Levels of RF microwave radiation have exploded in recent years with the advent of cellular technology and WiFi. WiFi is extremely convenient, and as a result, we tend to overlook the possible disadvantages. We’ve heard about conflicting studies on cell phones, but not much about WiFi. WiFi emits very similar radiation, and is used for much greater lengths of time. Exposure levels surpass anything that has been studied thus far. If we compare this to long-term case control cell phone studies, all of which have found increased cancer risks, WiFi represents a much greater risk. This is a biological experiment that we are carrying out, and the children are the guinea pigs. Many have the impression that the science on RF radiofrequency radiation is inconclusive and that we need more research in order to know for sure if there are any harmful effects. It is suprising to find out just how much research exists. There are actually 1000′s of studies that go back at least to the 1920′s that show bioeffects from RF radiation. There is more than enough evidence to take precautionary action and to protect our children and teachers from potential harm from unnecessary RF radiation exposure. The main reason why the official word is that WiFi is safe is that it emits lower levels of radiation than the FCC exposure guidelines. This is true, however the FCC guidelines are placed at levels so high that they don’t offer protection from many adverse effects. They are purely based on thermal effects, meaning how much radiation it would take for your body to start to cook. They do not take into consideration any of the 1000′s of studies that have found bioeffects at much lower levels. To give you an example of how high they have been set, you could have a source of radiation 1000′s of times higher than a cell phone tower inside a school and it would still be ok with the FCC. There is ongoing research taking place on RF radiation, but much of it is industry-funded, leaving the possiblity for conflict of interest. There is next to no research on RF taking place in the United States, despite how fast wireless technologies are expanding. The EPA used to have world-class laboratories dedicated to studying RF, but these were defunded right about the same time as cell phones came out in the 1990′s.The mainstream media tells us that the jury is still out with the on cell phones and other devices and that we need more time and research. This leads to the million dollar question: Do you think that an industry this powerful is going to fund research that finds its products harmful? We’re going to be waiting for a long time if we expect all the research to agree. In 2011, 31 scientists from 14 countries met in Lyons, France to review the science of RF. As a result, the International Agency for Research on Cancer (IARC) and the World Health Organization classified RF Radiofrequency as a class 2B possible human carcinogen. RF is now in the same category as lead paint, exhaust fumes, and DDT. Link. All substances are first classified as possible 2B carcinogens.This IARC classification is not limited to cell phones, but applies to all sources of RF radiation. Within the educational video section is a interview with IARC in which they make this clear. For a certain portion of the population wireless devices and RF radiation cause immediate adverse health effects. It’s estimated that between 5% and 10% of the population suffer from electro-hyper-sensitivity syndrome or EHS. This percentage of the population with EHS appears to be growing and at this rate of growth is predicted to reach 50% of the population by 2017. Given this, within each school is a number students who are experiencing adverse reactions to WiFi, and whose health is at risk. Despite it’s wide adoption by schools, very little research has been conducted on WiFi, and certainly no long-term studies have ever been performed on children to show it to be safe. There have been 1000s of studies conducted over the last 80 years on radio frequency radiation that have found bio-effects, and some very clear examples of causal evidence that RF radiation is a clear health risk, especially to children. Of the few studies that exist, one was recently published in the Journal of Fertility and Sterility that found exposure to WiFi laptops damaged DNA and the reproductive system in as little as 4 hours. Although this was a preliminary study, and long-term research is needed, there are many studies before it that found RF microwave radiation does genetic damage. Here is a report that shows this in detail.